Moves to increase Cooperation for Better Small Island Forecasts — SIDS or Territories??. . .
A global campaign to improve weather and climate services for all small island developing states was launched today with the support of the World Meteorological Organisation (WMO), the Secretariat of the Pacific Regional Environment Programme (SPREP) and Digicel Pacific. 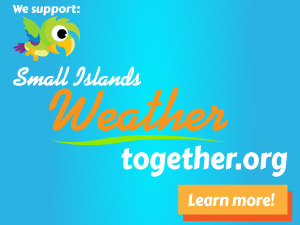 The Small Islands, Weather Together campaign (www.weathertogether.org) aims to show how the small island developing states of the world can work together to improve their vital weather and climate services. In the Pacific region alone, extreme weather already accounts for 76% of all disasters with 50% directly related to cyclones. The increase in extreme weather events is also hampering the sustainable development of many small island developing states. For example, when Cyclone Evan hit Samoa in December 2012 it resulted in the loss of one third of the country’s entire annual economic output. WMO Secretary-General Michel Jarraud stresses that small island developing states need greater investment to further strengthen their vital weather and climate services and to ensure that efforts towards sustainable development are not wasted. “If we don’t invest in stronger weather and climate services for small island developing states then extreme weather events could simply wipe out years of development effort if they are not well prepared. It is much more cost-effective to invest in early preparedness and prevention than to focus only on rehabilitation and post-disaster action,” he asserted. Climate change is increasing the frequency and intensity of weather and climate events – cyclones, typhoons, drought, flash floods – in many small island developing states. But many of their Meteorological Services still lack the basic infrastructure, technology and expertise they need to protect vulnerable island communities and economies. For Mr. Jarraud, there is an urgent need to enhance the quality of early warnings for extreme weather. He pointed out that the formulation and dissemination of these warnings also need to be improved so that they can be understood and used by the island communities and government agencies. In the Pacific islands, SPREP and other partners are working to improve communication of this type of information in partnership with national meteorological services, the media, including broadcast stations and communities. “SPREP recognises that weather forecasts and warnings such as those given during tropical cyclones do not have a shelf life, they must be disseminated rapidly to the public or else they are useless,” says SPREP Acting Director General Kosi Latu. Mr. Jarraud recalls that the small developing island states stand to suffer more and more if the global community fails to agree to a limit in greenhouse gas emissions, the main human cause of climate change and global warming. “Greenhouse gas emissions are still on the rise. We need to reach a peak of emission over the next 15–20 years, then to decrease dramatically to zero equivalent emission in about 50–60 years from now. “This is a huge challenge. We must act now. The more we wait, the more difficult it will be, and, therefore, the more expensive it will be for countries to adapt to climate change. If we do not act now, we are agreeing to leave the small island developing states in a situation which may no longer be manageable,” he warned. The Small Islands, Weather Together campaign was launched specifically to coincide with the lead up to the United Nations Third International Conference on Small Island Developing States, which will be held in Apia, Samoa, from 1–4 September, 2014.